Home / Clearance / DrumQuik DQPUR120112209 PUR Flare Coupler FFKM O-Ring PEEK PPS Spring - 3/4"
DrumQuik DQPUR120112209 PUR Flare Coupler FFKM O-Ring PEEK PPS Spring - 3/4"
DrumQuik PUR Couplers are designed with quick connect/disconnect capabilities in order to allow for faster drum change outs. PUR couplers are cleanroom manufactured in order to provide a high level of purity. These couplers come with an automatic shutoff valve and are constructed out of PVDF. 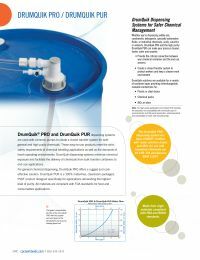 Using DrumQuik dispensing systems helps users keep a clean and safe work environment. NOTE: If interested in buying the DQPUR120112209 in large quantities, please contact one of our Customer Service Representatives at 877-335-3339 to discuss available pack-quantity discounts.